Sometimes you need to select fields that will create a grouping key. This can be done in the Edit key dialog. 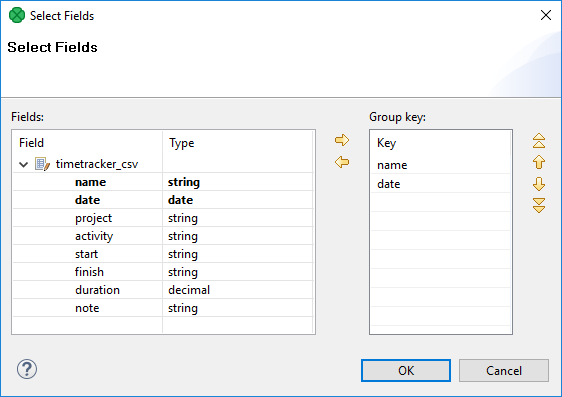 After opening the dialog, you need to select the fields that should create the group key. After selecting the fields, you can click the OK button and the selected field names will turn to a sequence of the same field names separated by a semicolon. This sequence can be seen in the corresponding attribute row. The resulting group key is a sequence of field names separated by a semicolon. It looks like this: FieldM;...FieldN. In this kind of key, no sort order is shown unlike in Sort key. By default, the order is ascending for all fields and priority of these fields descends down from top in the dialog pane and to the right from the left in the attribute row. For more detailed information, see Sort Key. When a key is defined and used in a component, input records are gathered together into a group of the records with equal key values. Auto - the sorting order of the input records is guessed from the first two records with different value in the key field, i.e., from the first records of the first two groups.